This Imperial Milk Stout breaks all the rules by combining flavors of graham cracker, toasted marshmallow and dark chocolate. “Chubby Bunny” is our 4th installment of our employee home-brew competition. 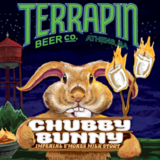 This mouthful of a stout will challenge any beer lover to say Chubby Bunny.